Born in Shettleston in Glasgow, he worked as a Post Office engineer until war service in the Royal Navy, after which he became a Customs Officer in Ireland and on the West Coast of Scotland. Inspired by Italian metal sculpture, he attended welding classes at Royal Technical College (now University of Strathclyde), and studied part-time at GSA . Becoming a full-time artist in 1979, he specialised in mixed media, kinetic, installation and performance art, and developed a distinctive form of "Social Scul?ture", humorously exploring Joseph Beuy's assertion that "all art is questionable" (Nisbet, in McKenzie (1999) ). Exhibiting regularly throughout the UK since the 1960's, his work is represented in major public and private collections including, GMAG , University of Stirling and the Scottish Arts Council. 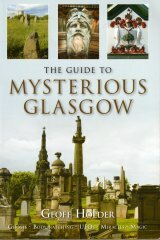 His contributions to Glasgow's Mayfest include Just In Case, Glasgow Cross (1995), and the Straw Locomotive (1987). For the 1988 Glasgow Garden Festival he produced Arrivals and Sailings. An artist of international stature, his Gulbenkian Prize-winning Paper Boat sailed down the Clyde, Sheldt and Hudson rivers in 1990. Scotland on Sunday newspaper now gives "Paper Boat Awards" to artists producing work of distinction. One of his ventures, a giant Crystal Ship (2000), was proposed as a permanent feature of the rejuvenated Govan dry dock, but sadly never materialised. Based in Gourock since 1959, he was also a painter, musician and song writer, and donated his collected works to the University of Strathclyde, which includes his famous colossal safety pin Monument to Maternity on the site of the Rottenrow Maternity Hospital on the university campus. To mark his 90th birthday, the university's Collins Gallery mounted a retrospective of George's life and work, George Wyllie A Life Less Ordinary (10 March - 21 April 2012), as part of a wider celebration of his career held throughout the city: The Whysman Festival. It was during these events that George passed away, and it was fitting that his exit from the Scottish art scene should have occurred with such a blaze of glory and recognition that these festivals provided in celebrating him as Scotland's best loved sculptor.